In anycase I will try to go through all the details of this tent as well as include a bunch of pictures, as I feel pictures really do speak a thousands words. 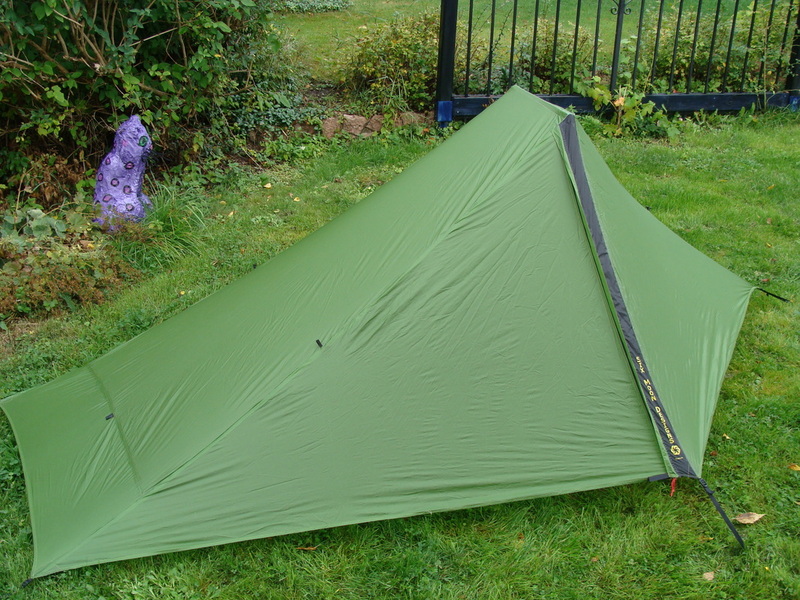 As you can see for yourself the SMD skyscape trekker is a fantastic looking tent. 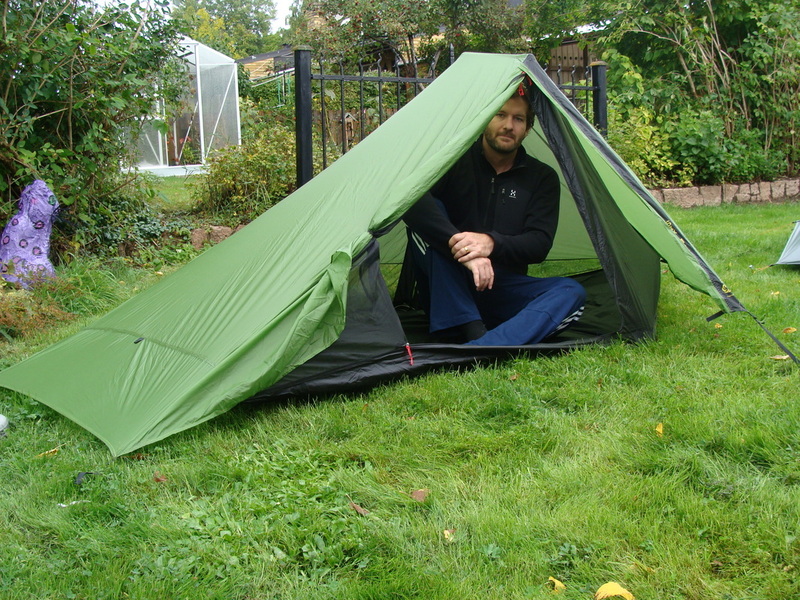 Compared to the Akto this tent just reeks “coolness” – Very sleek very cool design. This is a hybrid between a single wall tent and a double walled tent. The sides of the vestibules fold up to allow a very open view of nature. There really is no other tent or tarp that can compare to this. This is the closest you can get to sleeping under the stars without the pleasures of being eaten by bugs and big crawly things on the ground. Though not as roomy as the Hilleberg akto, the skyscape trekker does offer very usable space and unless you are as fussy as I am, this tent should offer more than plenty room for most lightweight enthusiasts. I am 190cm or 6’3″ and I find the length and height to be more usable than in the hilleberg akto: this is mainly because there is no sagging inner tent. The Skyscape trekker uses two walking poles stretched out to about 115cm each. This gives me plenty of room to situp and eat if its raining and so on. The floor space is a respectable 2.2m and as you can see from the pictures below I can situp, lay down and stretch out, and my fits fits very comfortably and she’s 5’7″. There is no doubt that the Skyscape trekker is one of the best ultralight tents for the weight and cost. at 630 grams (on my scales minus the stuff sack and tent pegs) it’s one of the lightest solo tents, and definitely one of the cheapest for the weight. 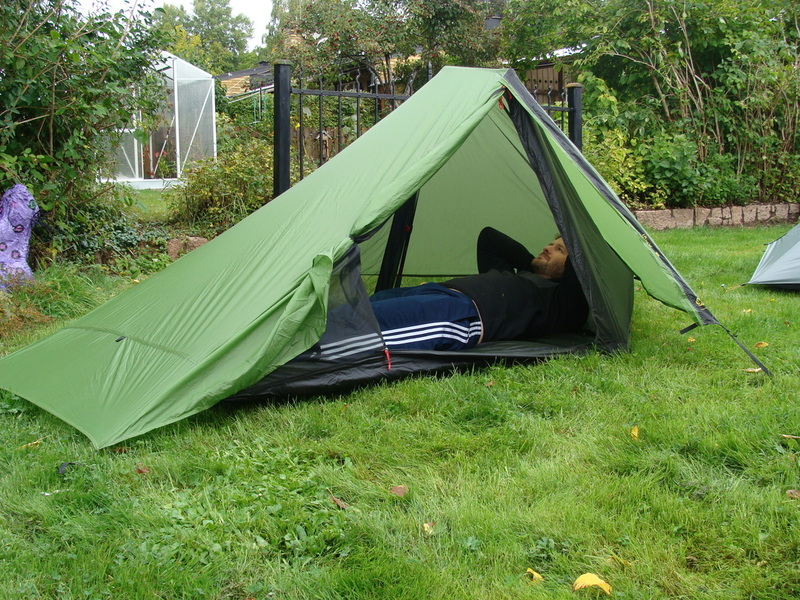 To get lighter you have to start moving over to Cuben fiber tents then you might save 150grams, and cost you twice as much. This is where you have to decide for yourself if the 150grams saved is worth the cost. I really enjoy my time in the Skyscape trekker, it’s fast and easy to setup, very lightweight and cost effective. It’s a great shelter for 3 season trekking and one that I’m sure will be an excellent choice for most backpackers. My only real gripes with it have to do with my size and pickiness – I would like a little extra room to stretch out in and I wouldn’t want to be stuck in a real storm with this. I’m sure it would hold up, but my guess is that you will find yourself clenching onto the trekking poles with all your might. I also have a few gripes about the size. 1. because the top of the trekker is pointed off, I find that I have a hard time sleeping on my side comfortably without resting my entire arm on the side of the tent. This is fine until the weight of my arms pushes up the tent peg in the middle of the night… 2. I don’t find the vestibules to be so large, it’s perfect if I’m just bringing my day pack, but I wouldn’t want to try pushing it with all my fishing gear, and a larger pack. One other key point for me: I don’t use trekking poles, which means that this tent with the added weight of trekking poles pushes it to over 1 kilo. For those of you who use trekking poles this is great, for me, not so much. 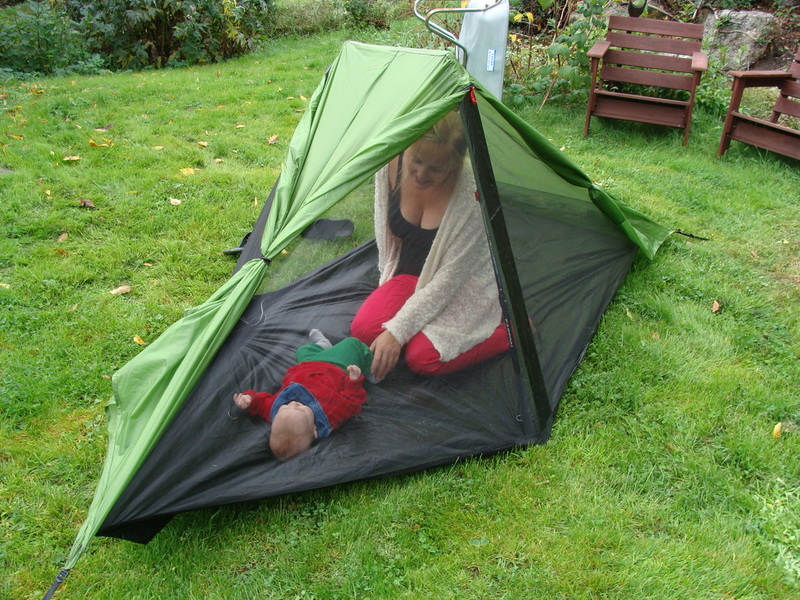 I give this tent high points for weight, looks, ease to setup and usability. It loses a point in roominess and sturdiness. 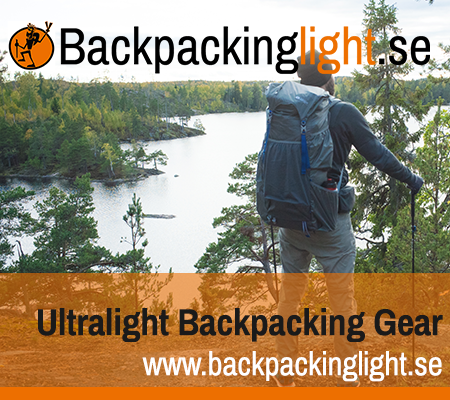 If you don`t use trekking poles, you can buy the poles that goes with the tent at SMD site, that adds about 100 gr and gives you some of the cheapest and lightest there is. So, judge it fair, ok? Hello. I just had a quick question, do you feel that had you slept with your legs/feet semi diagonal toward one side or the other you would be able to fit your pack in the tent also? Hope my question make sense. Excellent review and thank you for all the pictures. Good stuff indeed. Which would you recommend for a 190cm man, with an inner mesh? Thanks! Nice to see a review from a tall person’s perspective. I’m about the same height and was there any clearance from your head and feet or where you touching both ends of the tent?